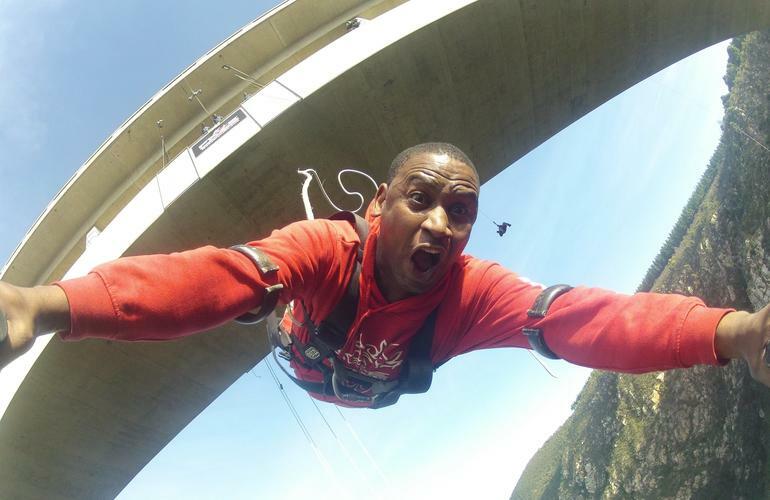 Enjoy Africa's highest bungee jump and tick off the number one bucket list item! 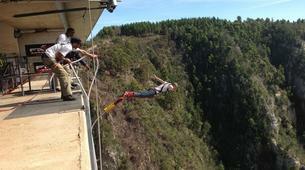 Bloukrans Bridge Bungy offers you a jump from 216 metres above sea level and will satisfy all thrill seekers out there. 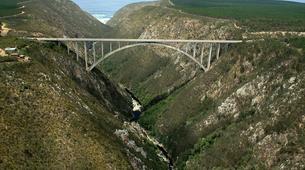 The Bloukrans Bungy is Africa's highest commercial bungee bridge. 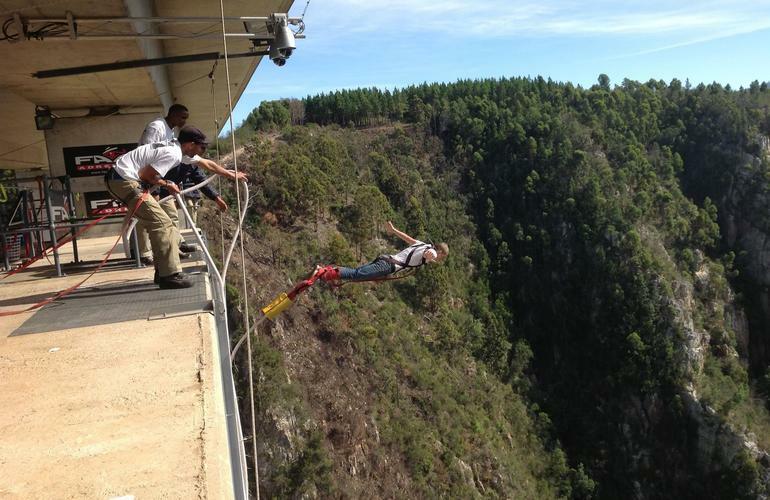 There have been a number of world records associated with Bloukrans. 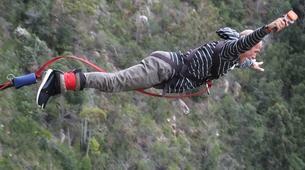 In 2003, Bloukrans Bungy was recognised as the worlds highest commercial bungee jump. 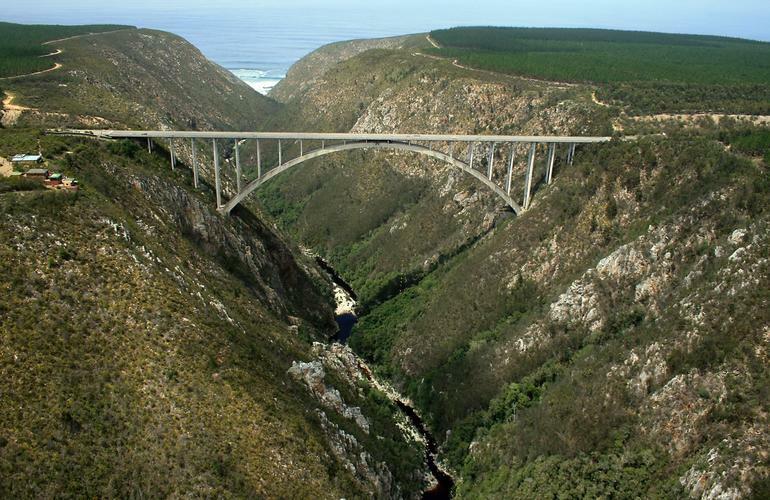 In 2008 the bridge was part of two more world records. 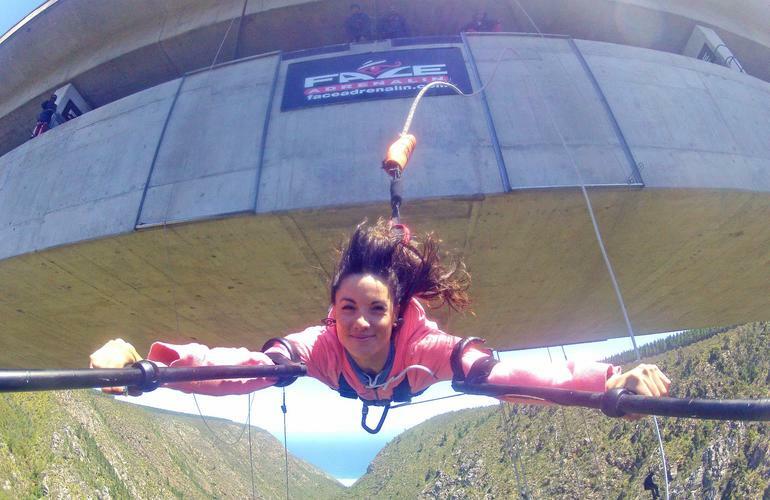 Veronica Dean performed 19 bungee jumps in one hour and Bill Boshoff performed 101 bungee jumps in a 24 hour period. 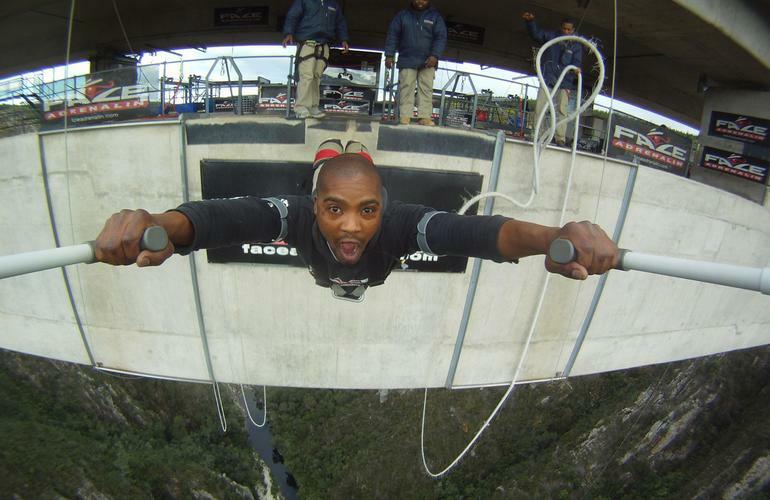 Bill’s world record was subsequently surpassed, but in 2011 Face Adrenaline facilitated Scott Huntley to regain the world record with 107 bungee jumps in the 24 hour period. Face Adrenaline has played host to the likes of Prince Harry, Jack Osbourne, Thabo Mbeki, the Zuma family, Bobby Skinstad, Hansie Cronje, Fanie De Villiers, Kelly Slater, Andy Irons, The Amazing Race, and many more famous and not so famous visitors - you never know who you could meet on any given day at Bloukrans, the world's highest bungee bridge! 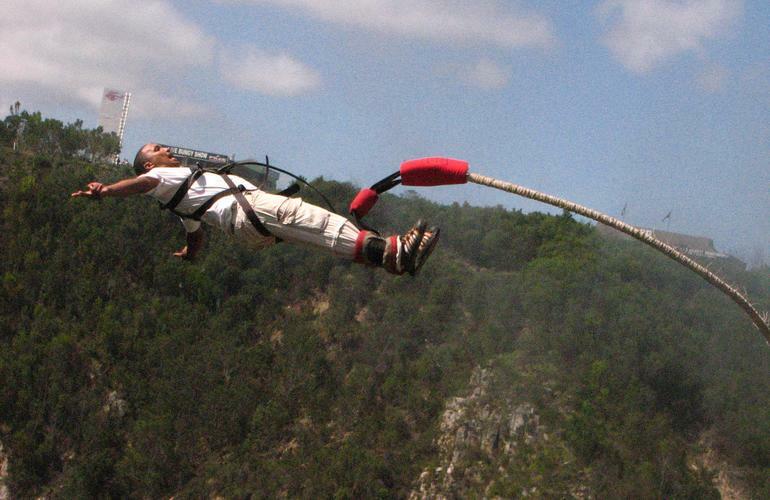 It is time to take the leap of faith: 5, 4, 3, 2, 1, BUNGEE! Please note that you have to be at the meeting point one hour before your activity begins. 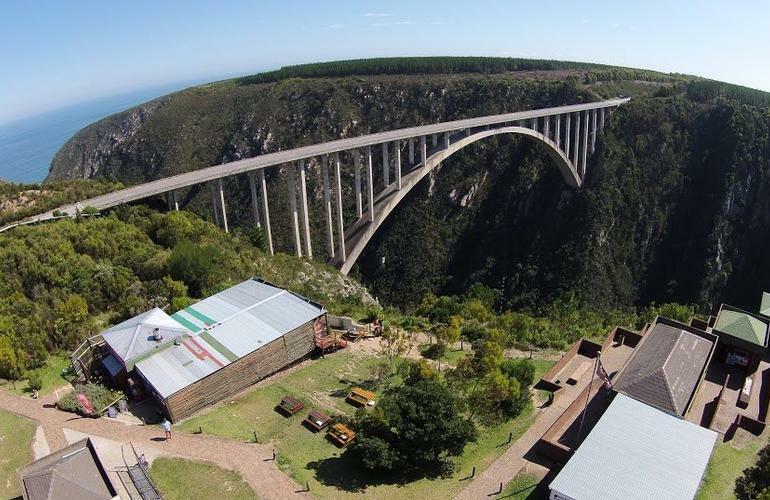 You'll meet the team at Bloukrans Bridge at the border between the Eastern Cape and the Western Cape in the Tsitsikamma area of South Africa’s Garden Route. You'll walk along the specially designed catwalk suspended beneath the road surface. 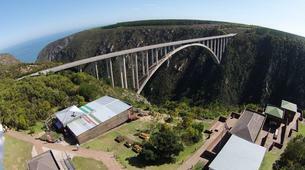 It leads to the launch site at the top of the arch that stands at an enormous 216 metres. The walk alone can be absolutely terrifying for some! 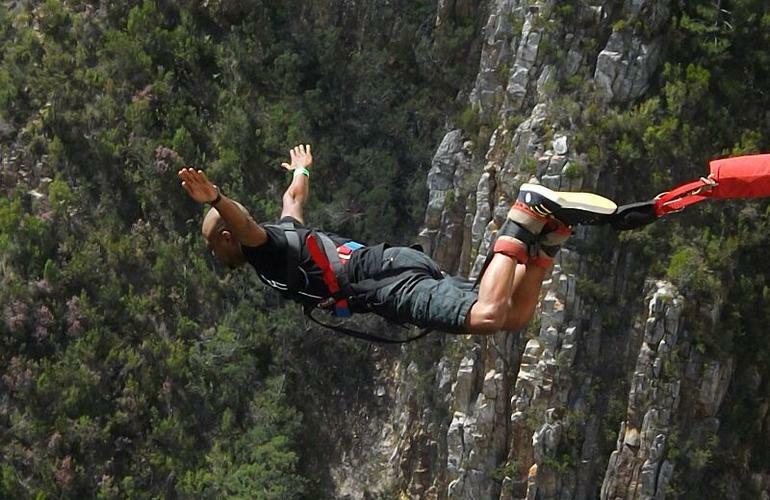 You also have the option to get to the launch site by way of the Flying Fox – a 200m zipline/cable slide (or foefie slide to South Africans). The adrenaline in your veins will now be flowing. 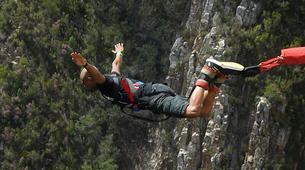 After this death-defying feat you will be winched back up to the bridge and then led back to the edge of the canyon. WOW what an experience! 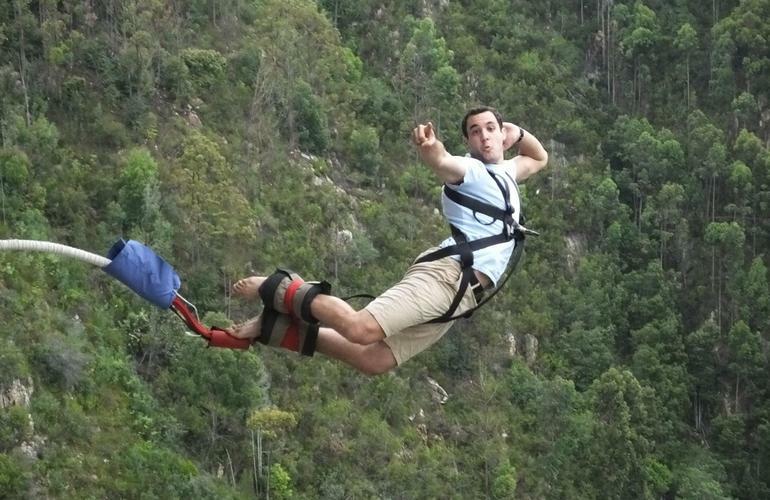 Now it's time to rest and recall the day’s events with fellow bungee adventurers. 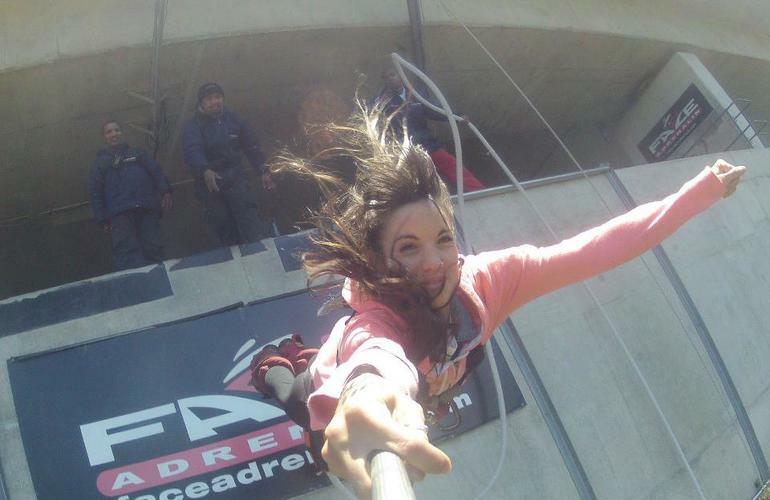 You must arrive at FACE ADRENALINE an hour before the activity begins. 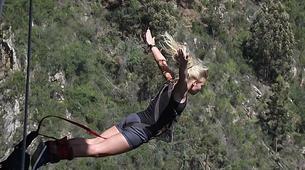 The following are some of the conditions that may be adversely impacted by bungee jumping. This does not necessarily exclude you from jumping, but they may require you to obtain a medical certificate approving your intention to participate. All participants must weight between 35 kg. and 150 kg. 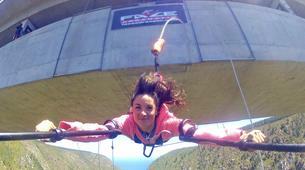 3, 2, 1, BUNGEEE....... 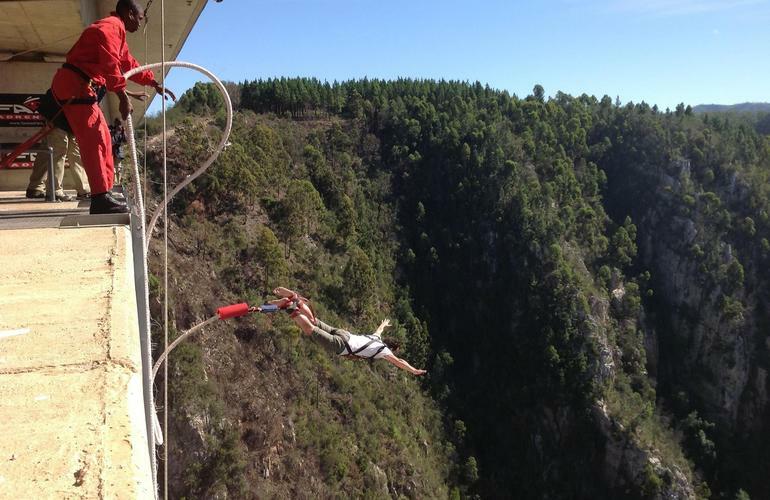 I have done bungee for the first time and I suggest everyone to experience this once. Very friendly, professional, and welcoming staff to make this an awesome activity. I loved the fact that you also get to zipline to the bridge and walk back on the path way. 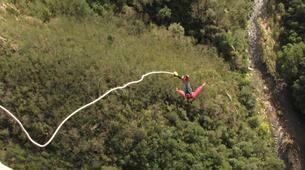 Makes it a complete experience together with the bungee jump. Great experience itself but the instructors make it super special and nice on top! One of the best experiences I have ever had! Simplesmente uma das melhores coisas que fiz na vida, a sensação de felicidade pós salto junto com a adrenalina, é demais. the activity was amazing. 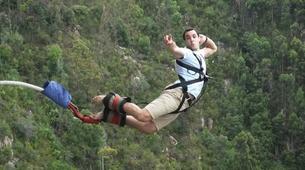 both the zip line and bungee just hit the perfect spot for me as an adrenalin junkie. Was absolutely fantastic, one of the best experiences of my life! A rush of adrenaline! You won't be disappointed! It was incredible! The staff and helpers were all exciting and the music and the cacophony sound all added to the jump off the bridge. When I jumped, I had no fear except for halfway down and I thought, “why are u doing this, are u crazy?” It was the best experience ever. What an experience! 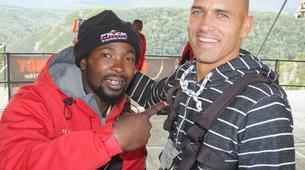 The Zipline had its thrills already; then the preparation. Sheer horror when standing at the edge of the bridge; still the trust in the equipment and these excellent guys guiding you through. The rest: awesome! It was fun and exciting. 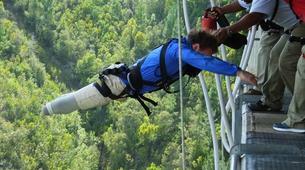 Massive adrenaline rush! 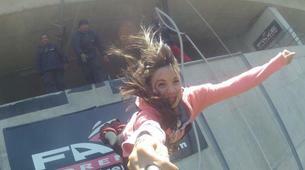 An amazing experience that I will never forget.. Views are amazing despite dangling upside down! The activity well organized, good staff compliment. Guys were great, put us at ease with their jokes and dancing! Well amazing team! It was one of my best experiences in my life, would do it again. Just do it - once in a lifetime experience. Nice staff and safe! 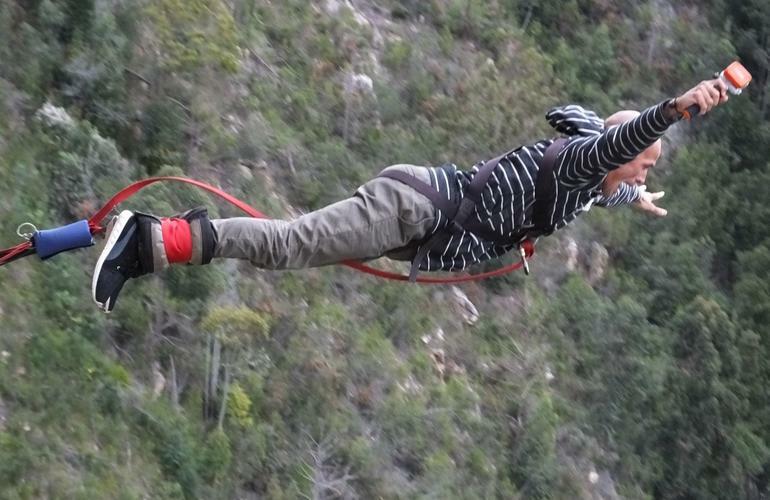 The Bungee was amazing! Everyone there was really nice and there is loud music and a great atmosphere on the bridge. You need a lot of time, because if you pre book a jump at 1pm, you jump between 2-3pm. 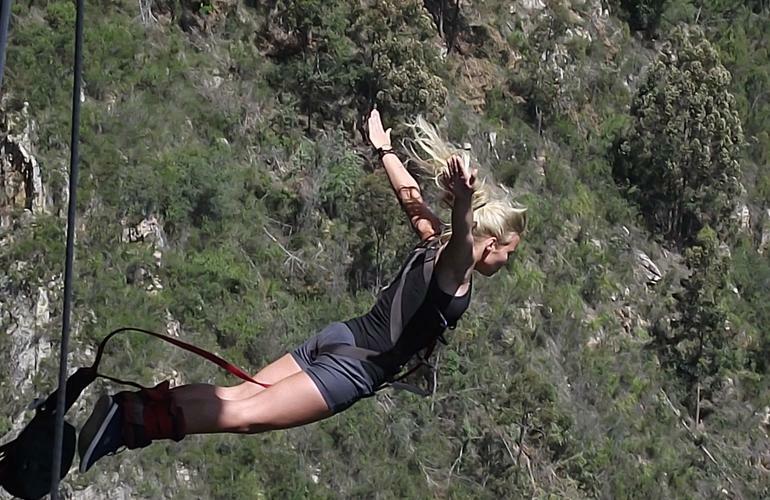 I did the bungee and I’m definitely going to do it again (maybe a back flip?). 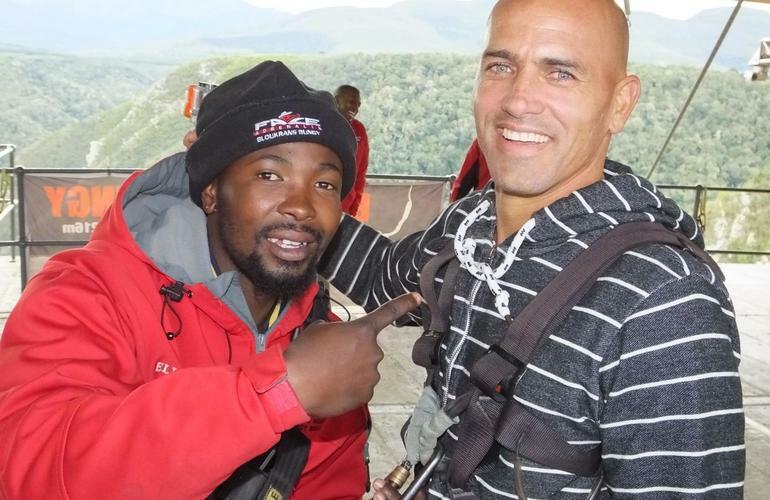 The staff is friendly, you feel comfortable all the time and there is no need not to trust in those people working at the Bungee station. Thumbs up up up!! It was amazing, I just Wanted to do it a second Time! Can Not believe that I Really did it! Super friendly staff, making you feel less nervous before the jump. Great atmosphere on the bridge with the music, the staff and in your group. 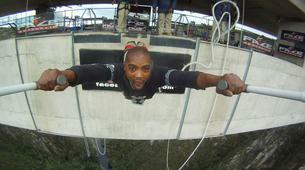 The jump cannot really be described, you have to experience it by yourself. Totally worth it and I would definitely do it again! 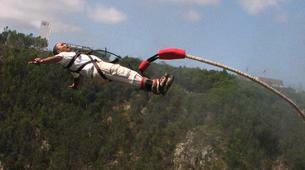 The biggest thrill of my life - well organised and a great team to get you over the edge! Can't believe we did it but wonderful feeling. Leaves you buzzing for days afterwards. 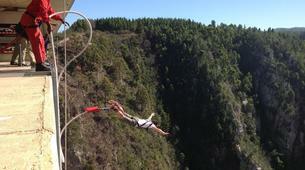 This bungee is absolutely stunning ! 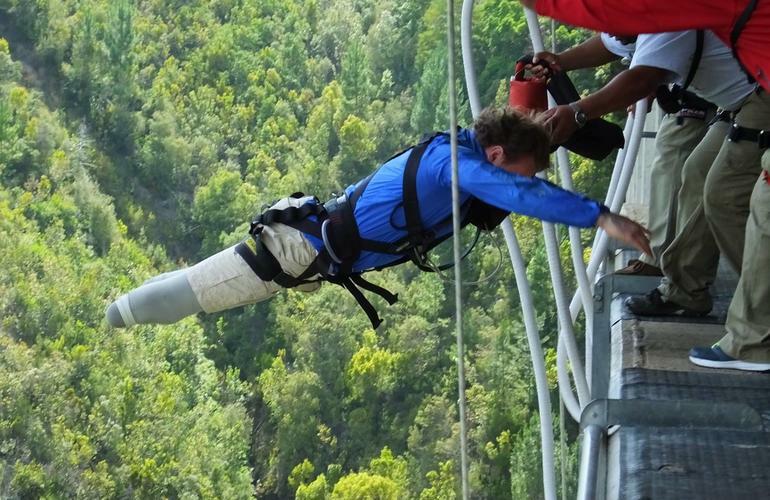 Great experience and definitaly a must do for adrenaline seekers. Well organised. Very professional and reassuring. Impossible to explain in words the exhilaration you feel. There was an uplifting and positive vibe. The staff was happy and enthusiastic. Nice experience. I like how organized the whole thing is. The music and those guys dancing there was wow !!!! Friendly staff and they make you feel important. Friendly, funny and professional staff! 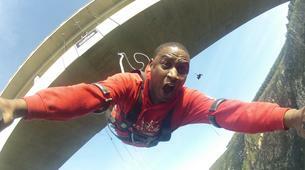 The jump was really exciting and I got an amazing video. 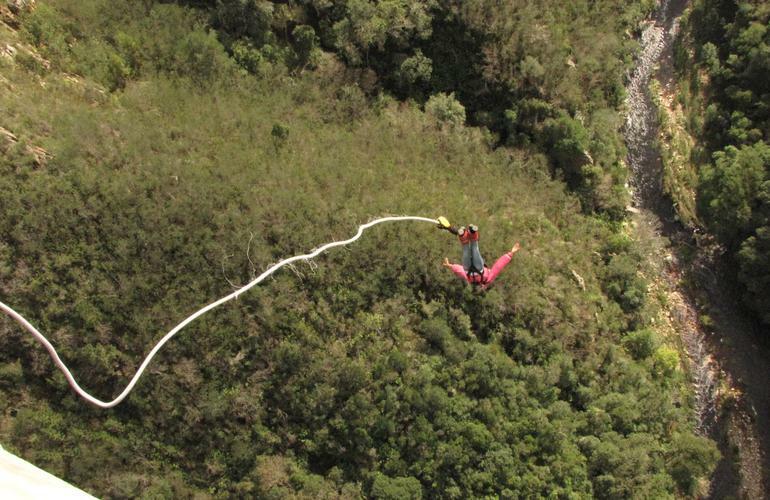 This bungee, from that location, is absolutely stunning. Very well organized, beautiful location, friendly staff, it was just fantastic. It is one hell of an experience. You live only once, and if you live it to the fullest, that once is enough. And only experience like this makes your life worth living..